It makes little political sense to argue that UAF and Hope Note are “just the same” or identical. Yes, I agree that both groups are “toxic” (as posh Leftists say of every critic of Islam and all members of the EDL). Nonetheless, there are some differences which may be worthwhile to note. Because of these ideological and strategic differences, it's no wonder that Trotskyist groups (such as UAF) and communist groups (such as Hope Not Hate) have always been at each other's throats. (In fact rival Trotskyist groups have often been at each other's throats too.) For example, the Communist Party of Great Britain (CPGB) is constantly slagging off the SWP. (Then again, so too is Alliance for Workers' Liberty - and this group is Trotskyist.) So it will come as know surprise that UAF-SWP doesn't have much time for Hope Not Hate. Take this example – one of many – of a UAF/Hope Not Hate rift. This highlights one of the reasons why UAF, being Trotskyist rather than old-style communist, is far more extreme than Hope Not Hate. 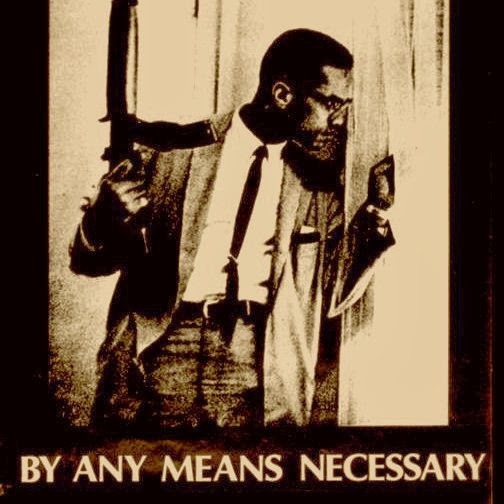 Because Trotskyists believe that “the ends justify the means” (Trotskyists justify this by saying that all their many enemies also believe it – thus the motto itself is justified by the Trotskyist end), and that revolution and radicalisation must be brought about “by any means necessary” (the black machismo of Malcolm X has always appealed to white, middle-class, effete Leftists), and that “lying for justice” (i.e. Trotskyist taqiyya) is completely acceptable and even encouraged, it will come as no surprise that UAF won't offer a single criticism of any Muslim or any Islamic group – ever. This is quite literally the case for the ideological fundamentalists and zealots who make up UAF. Quite simply, if you were to talk in any critical way at all about, say, Muslim grooming gangs, or even Islamic terrorists, you would automatically be, by Trotskyist definition or diktat, a “racist” and/or a “fascist”. This is not a subject for debate, according to UAF. (Nothing is genuinely debated by UAF.) And that is the reason why UAF not only never criticises Muslims or Islamic groups; but also why it always defends or supports them. Not to do so would be “racist” and/or “fascist; as well as to “side with the state” (to quote the SWP's now-dead Chris Harman). Unless you realise how extreme - literally extreme - UAF is, you will remain perplexed by what it does and says. You will simply never understand the perverse alliances it forms and perverse causes it fights for. Trotskyist zealotry leads inexorably to such perverse and absurd positions/actions. And, in a certain sense, Trotskyists pride themselves on being extreme because they believe that such extremism (not a word they'd never use about themselves – only others) is precisely what's required to “smash the state” or to “smash racism and fascism”. In other words, fascist actions and views, as well as alliances with brown fascists, is required by Trotskyist groups in order to further revolution/radicalisation/destabilisation or not to “side with the state”. UAF went in further for the kill in the case of Nick Lowles. Here again UAF is parading its Trotskyist purity and extremism. Again, only by being extreme - and taking extreme views - can “racism”, “fascism”, etc. be “smashed” (a favorite word of the SWP). Thus any critical comment about any Muslim or black is quite literally racist and/or fascist to UAF – or, at the very least, it's a “concession to racist myths”. Trotskyist logic, as ever, is brutally simple. Trotskyist groups always take simple and extreme positions on virtually all subjects and this case was no exception. That crudity and fundamentalism is required for the revolutionary cause. Anything position or analysis with even an ounce of subtlety or complexity would quite simply work against the revolution or against “smashing fascism”. In response to all this UAF Hope Not Hate-bashing, Nick Lowles wrote to UAF and demanded a public apology. 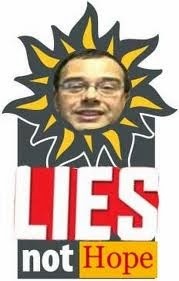 He even threatened UAF and gave it a deadline within which it was expected to apologise for accusing him of “personally of pandering to racism, spreading racist myths and writing material that would not be out of place on a BNP leaflet”. If UAF didn't comply, Lowles said at the time, he would “pursue this matter further, up to and including legal action against those responsible for the document”. And one way he threatened to “pursue this matter further” was by raising the issue with the TUC. As it happened, no apology was ever given by the ideological zealots of UAF. 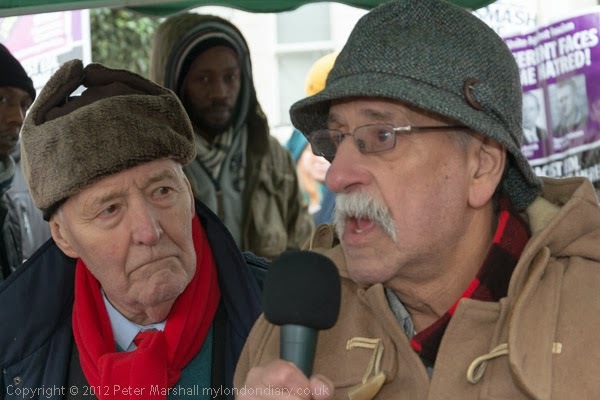 1a) Hope Not Hate: for a start, HnH was founded and originally led – or at least Searchlight was (Searchlight and Hope Not Hate split in 2011) - by an out-and-out communist. In other words, by a member of the Communist Party of Great Britain (CPGB) – Gerry Gable. Nick Lowles himself was a member of various ultra-Leftist groups in the 1980s and 1990s (such as Anti-Fascist Action, Red Action and Socialist Organiser ). This is not to say that all members or supporters of HnH are communists. Many will be Trotskyists or “progressives”. A very small number may even be apolitical. However, what matters with all political groups (as with the EDL and the Conservative Party) is not the political and personal nature of every single member, but the leadership and the broad ideologies they follow. 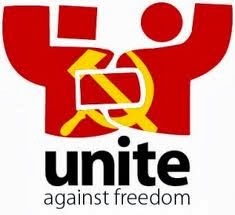 1b) UAF: whereas Searchlight was connected to the CPGB in the early days, UAF is literally the Socialist Workers Party (SWP). 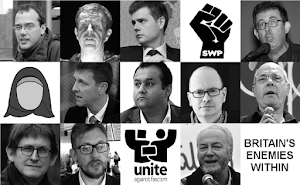 UAF is not just “strongly connected to the SWP”, as some have put it. UAF is simply a SWP front. Even the leaders of UAF couldn't possibly deny that (even if they wouldn't use the word “front”). Because the SWP is Trotskyist, then that means that UAF is Trotskyist too. 2a) Hope Not Hate: because of its broad communist sympathies (or, I should say, its commitment to communist parties and the Labour Party), HnH is far less extreme than UAF. For example, it doesn't have a specific ideological commitment to street violence (as well as violence generally) as the SWP-UAF has. This will partly explain why HnH is more closely connected to the Labour Party and the Daily Mirror than UAF is. 2b) UAF: Trotskyists such as UAF have a political fetish for violence. It's actually written into Trotskyist ideology and I don't only mean its commitment to the mass violence which will occur during and after a revolution. UAF, like all Trotskyist groups, believes in two mantras: “By any means necessary” and “The ends justify the means.” This explains everything about both the SWP and UAF: the violence, the “lies for justice”, the support of Islamic misogyny, Islamist violence, Islamic terrorism, halal meat, single-sexed schools, FGM, the niqab and burqa, Muslim grooming gangs, the IRA, the PLO, Hamas, Hezbollah, Yusuf al-Qaradawi , the Muslim Brotherhood “revolution” in Egypt, the Sudanese Islamist genocide against Christians and black animists, etc. You get the picture? Anything goes if it works against capitalism or the West (which more or less fuse in the minds of Trotskyists). 3a) Hope Not Hate: the “class structure” of HnH is overwhelmingly middle class. However, as I said earlier about its apolitical members, there will of course be a handful of working class supporters and members too. Communist groups have always been more closely connected to the working class than Trotskyist groups. Indeed it would be silly to deny that in the first half of the twentieth century, and to some extent after, there were many working-class communists and members of communist parties. (All the way up to Arthur Scargill in the 1970s and 1980s.) However, compared to non-Leftist working class, they still made up a small percentage of that class. Despite that, HnH doesn't even have that small percentage any more either. 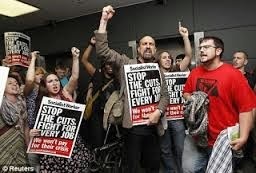 3b) UAF: Unite Against Fascism is almost completely middle class. In fact, when it comes to the SWP, the higher you go up the hierarchy the more likely the members and leaders will be upper-middle class, rather than middle class (or members of the much-hated, by Trots, petite bourgeoisie). Though many British communists have also been upper-middle class too, it seems that Trotskyist groups have a penchant for attracting extremely posh and privileged people. (Two members of the current SWP Central Committee are descendents of 19th century Lords.) From personal experience, I don't think I've ever met an activist of the SWP, or other Trotskyist groups, who wasn't posh and who didn't have that obligatory and often fake Estuary English glottal-stop accent. (They all literally sounded as if they all came from exactly the same class and exactly the same place.) Again, as with HnH, there are no doubt a handful of working class members of UAF and the SWP. (They may well clean the homes of the leadership.) And let's not forget that there's even a single and notable black member of UAF – Weyman Bennett.